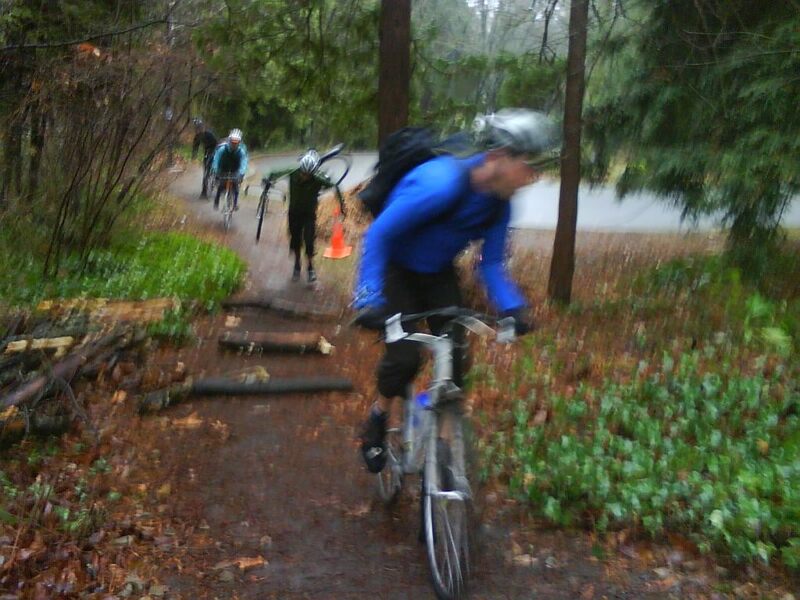 Yesterday morning, a pack of riders and I felt the call of the wild, and we answered it, venturing out on our cyclocross bikes to explore the backwoods of metropolitan Seattle. We had signed up for the first-ever Urban Coyote Poker Ride, organized by photographer and friend, Colin Meagher, and by 9:30 am we were on the hunt for poker cards stashed in several neighborhood park locations. Poker rides are fun—after collecting a handful of cards, the rider with the best hand wins—but we were also explorers on a mission, scouting out urban singletrack to ride. Seattle is actually sprinkled with parks, and not just the expansive and well-attended ones like Volunteer and Discovery. I’m talking about neighborhood “pocket” parks—little forested greenways cut through with dirt paths, some rarely trodden or ridden. The poker ride course gave us a tour of these parks, connecting them together with some familiar road biking routes and some new ones. We also had a soundtrack to our ride. One participant, Patrick, had decked out his bike with speakers, and they blasted the best of Guns ‘n Roses, Skid Row and Megadeth. 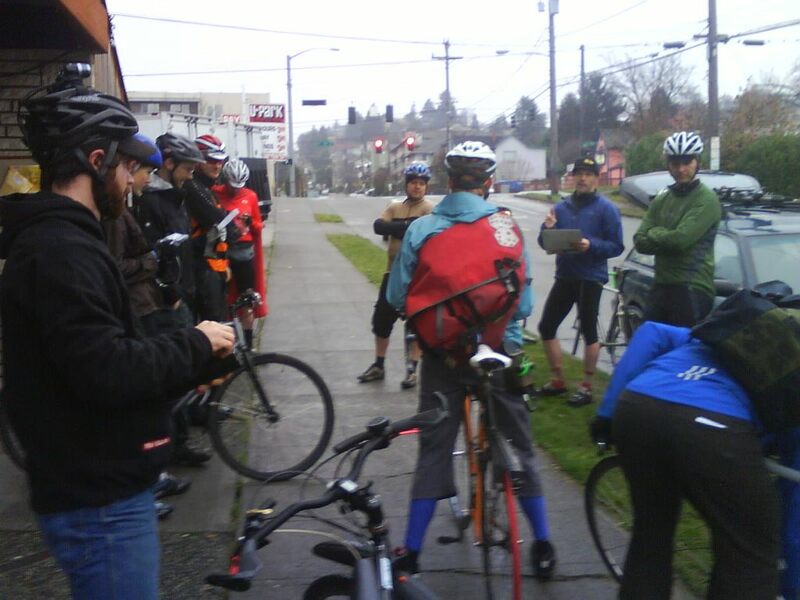 Rolling out of the Fremont neighborhood at 9:30, we warmed up on the Burke-Gilman Trail en route to Seward Park. 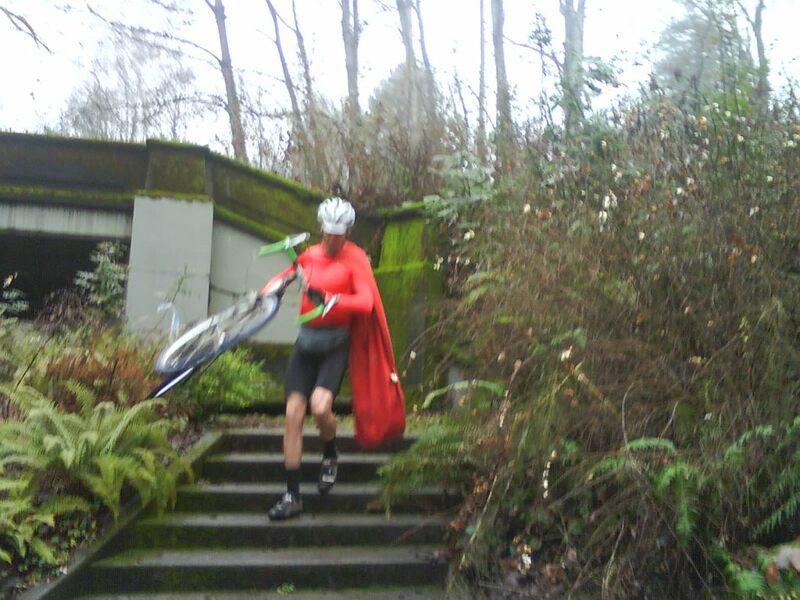 First stop (and first poker card) was to be found in the vicinity of Frink Park in the hills above Madrona. 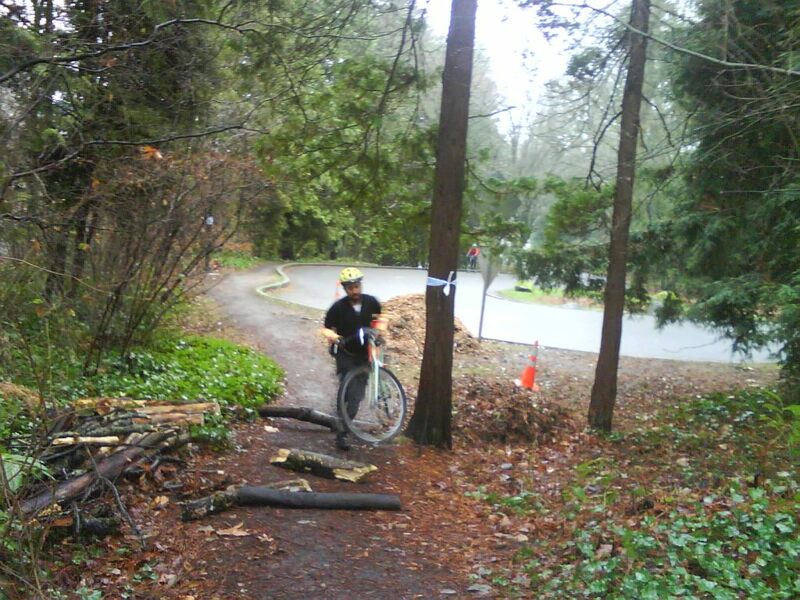 Of course, to get there, some riders had to overcome a crash or two on the mildewed high wooden bridge off Madrona Dr. hill, only to crash again on the water-bar-stepped singletrack descent into lower Frink Park. Not to worry—no one got hurt. It seems I was riding with a devil-may-care group of riders, all-too ready to fling themselves (and their bikes) into the spirit of the event. 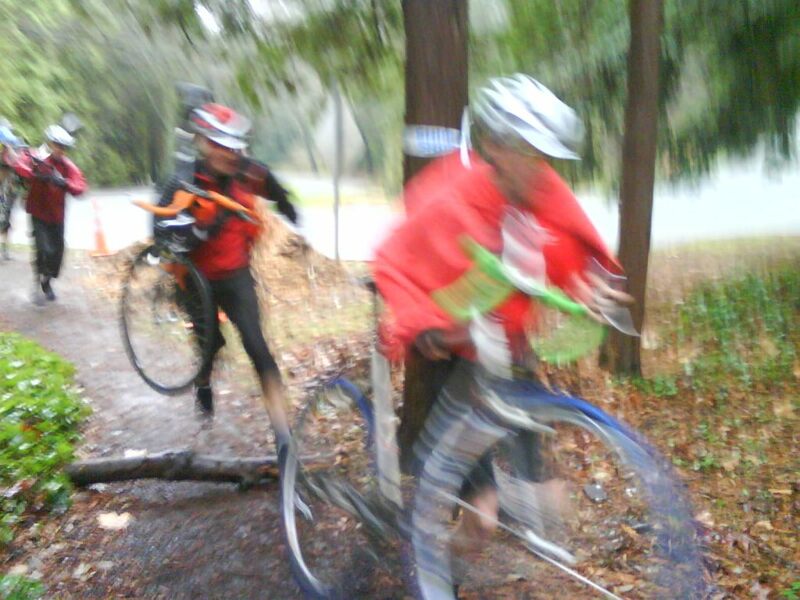 Some riders relied on their mad ‘cross skills to keep the rubber-side down. 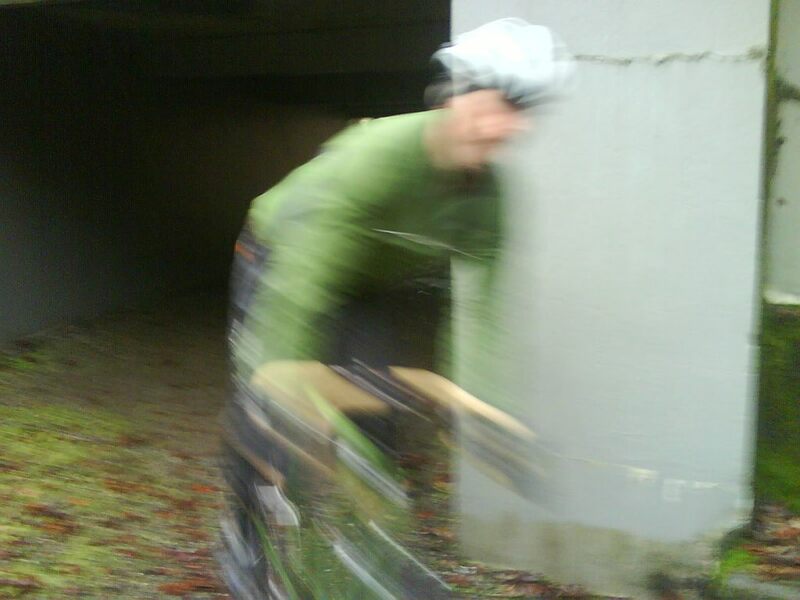 Here are a few photos of riders dropping into Colman Park on the south side of Interstate-90. ...and ride (or run) down the stairs. 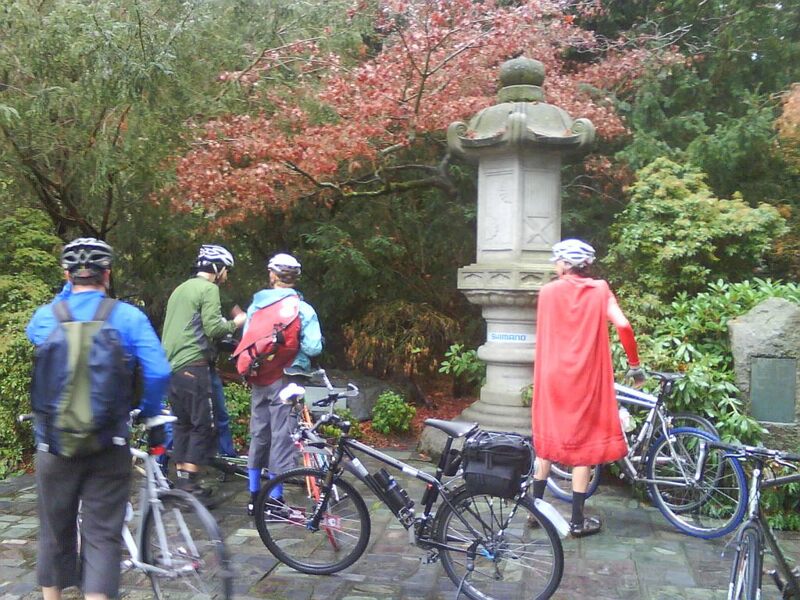 The second card stop was Seward Park. The cards were tucked away in the big pagoda inside of the park’s round-about. Riding back up Lake Washington Boulevard, we shunned the road and instead followed singletrack along the edge of Lake Washington until we reached Madrona hill again. 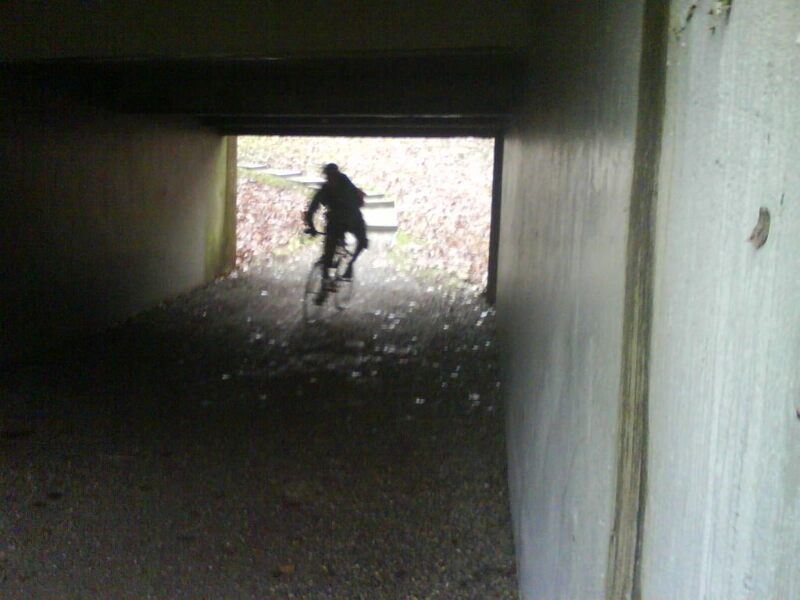 We rode once more across the slick bridge, ran up a flight of stairs and then dropped down residential streets to Viretta Park near Kurt Cobain’s former house, the perfect place to chug a can of beer in tribute. 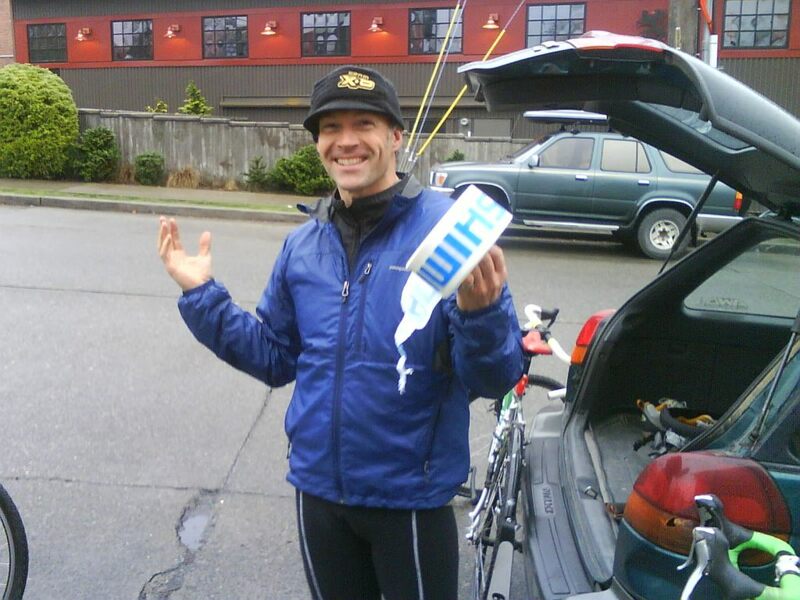 I left off the beer-chugging “Wild Card” option and rode on ahead, where I laid down a few logs to serve as (largely symbolic) barriers on the Lake Washington Blvd. run-up section. Once at the top of the run-up, at Lakeview Park, riders selected their next card. When we took to the streets again, I took off ahead and sprinted through the Arboretum. When I reached the end, I glanced behind and discovered that I was alone—I had taken a wrong turn. After backtracking and checking my crumpled directions, I still couldn’t find the route through Interlaken Park, where the fourth card was hidden. Then it began to rain. I took it as a sign. I left off my attempts at route-finding, bid farewell to the Urban Coyote and headed back to the ranch. Later I got a call from Colin inviting me out to Brouwer’s Cafe (the “finish line”) to celebrate Brian’s poker win with some Belgium brews. Thanks to Colin for putting together a fun and inclusive event. The event was also informative. The course took us along routes I’d never thought to take, and it covered terrain that looked new to me from atop a cyclocross bike. Seattle seems like a different city when one is on the hunt for secret gardens, hidden passageways and singletrack trails. 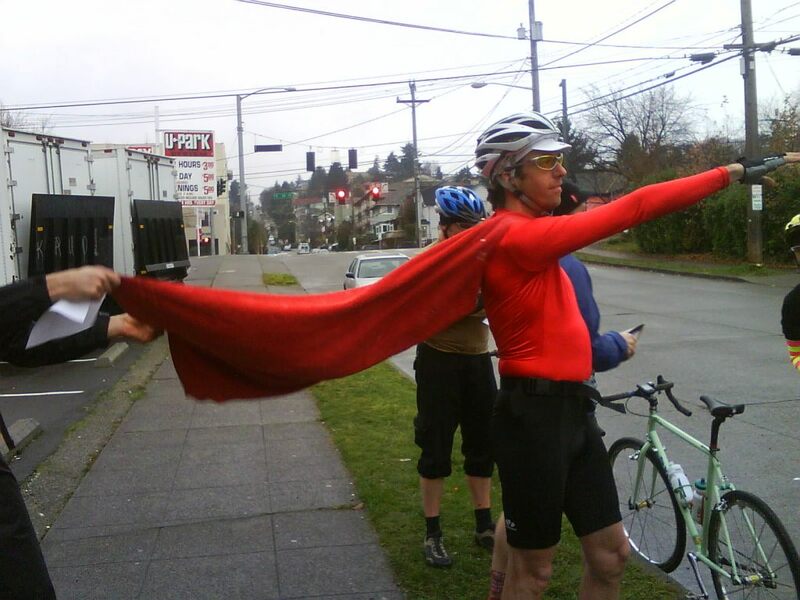 Seattle sounds a bit different, too, when one is rocking out to “Rocket Queen” with a pack of rowdy cyclists. The Urban Coyote—it’s just nostalgia waiting to happen. 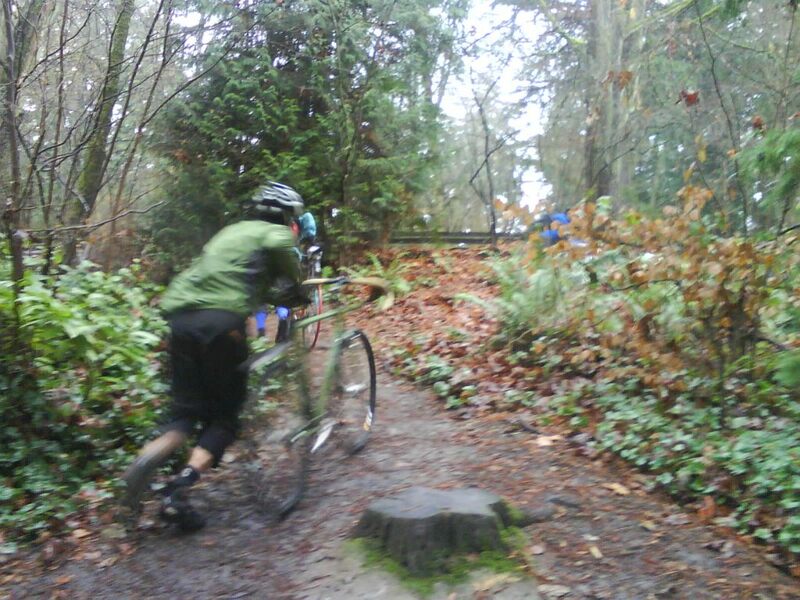 This entry was posted in Biking, Racing/Competition, Seattle trails and tagged bike messenger, biking, cycling, cyclocross, poker run, Seattle, Urban Coyote, Washington. Bookmark the permalink.